Bha an sgeulachd soirbheachais a th' ann am foghlam meadhan Gàidhlig a' sìor dhol bho neart gu neart, gu seachd àraid ann an Tunga. 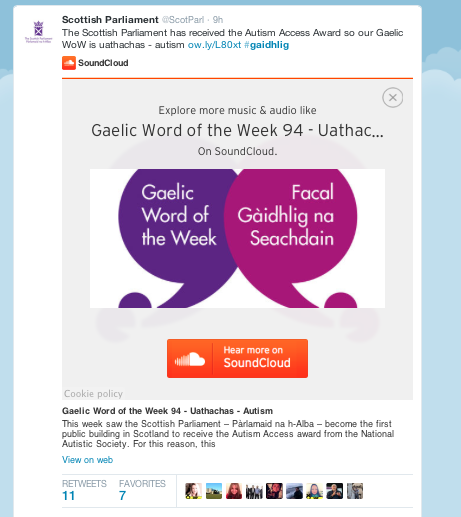 Ceum mòr eile air thoiseach 'son Gàidhlig ann an Cataibh a bha seo ... whoops! Thàinig Iain "Ceumanan Mòra" Caimbeul. Agus chuir MG Alba "co-chomhairle" air dòigh, a' cur nan ceist sa chànan aca fhèin, m.e. 1. Gu dè an ìre 's gu bheil sibh ag aontachadh gu bheil an t-amas "Lìbhrig seirbheisean co-bhanntachd PSB coileanta airson luchd-cleachdaidh na Gàidhlig" iomchaidh na amas ro-innleachdail do MG ALBA? 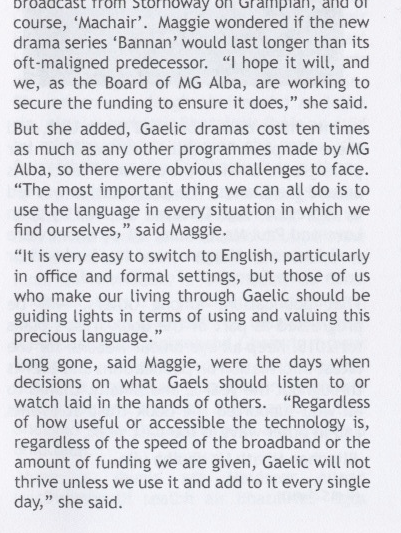 To what extent do you agree that the objective "Deliver PSB partnership services for Gaelic users" is an appropriate strategic objective for MG ALBA? Ceistean ciallach dha-rìribh,bidh sibh ag aontachadh, leis an robh Gilleasbuig air a dhòigh ghlan! "It was hard, however, to escape the conclusion that BBC Alba was not a key player in the referendum, or indeed before or since. In fact, the focus of the channel, remaining as it does on music and sport for much of the time, seems deliberately to avoid the more engaged and the more radical. 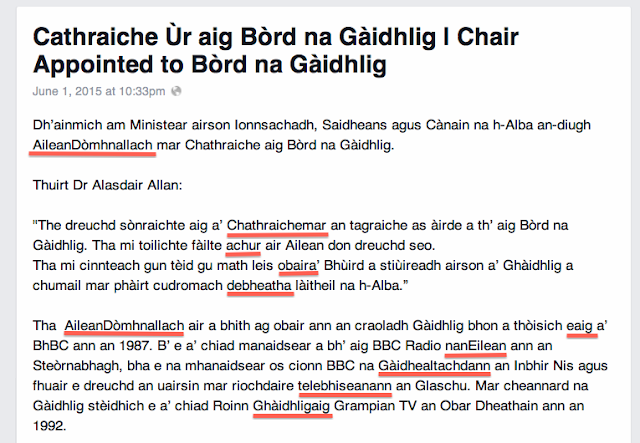 "I think it is time for Gaelic broadcasting to wake up to the country in which it is now set. Perhaps too content simply to exist, those who run the channel seem reluctant to set a new course that reflects current and future reality and which would give them a better opportunity for the language, culture and place to thrive". Gilleasbuig: Mo chreach 'sa thàinig! Neach deach innse ro-làimh dhan duine-sa gu bheil MG Alba an dùil ri cruth-atharrachadh a thoirt air buaidh nam meadhanan Gàidhlig ?? Eileen NicDhòmhnaill: Well, ann an dà mhìle ’sa trì deug cha do chuir ach lethcheud crìoch air a’ chùrsa [pregnant pause]. Neach-labhairt a' Bhùird: Tha mi smaoineachadh well tha – a thaobh na h-àireamhan, erm rannsachaidh seo bha sin gu – deireadh a’ Mhàirt an-uiridh. Agus tha mi smaoineachadh – eh – bidh barrachd fios aig Deiseal air cia mheud daoine cur crìoch air a’ chùrsa latha an-diugh mar gum biodh. Em – ach tha mi smaoineachadh - cha bi leisgeul sam bith – agamsa cantainn gun do chosg sinn – you know – erm – trì mìle not - gu robh trì mìle faighinn taic em, – iomchaidh bhon a’ sporan phoblach airson a’ bhith ag ionnsachadh na Gàidhlig. "Tha sinne mar Bhòrd a’ leantainn oirnn a’ toirt dlùth aire gu bheil prìomhachas air a thoirt dhan Ghàidhlig anns gach prògram. Tha sinn air an aon ràmh ris an luchd-amhairc air a’ chuspair seo agus tha sinn an dòchas gu faic sinn piseach mòr air an t-suidheachadh sin anns a’ bhliadhna a tha romhainn. Tha e riatanach gu bheil na riochdairean a’ faighinn an taic a tha a dhìth orra airson a bhith mothachail air cho cudromach is a tha e an t-urram air a bheil i airidh a thoirt dhan chànan – ’s e sin fìor bhunait ar stèidh". ri tighinn fhathast a chàirdean! The Mòd: so many press releases, so little time! 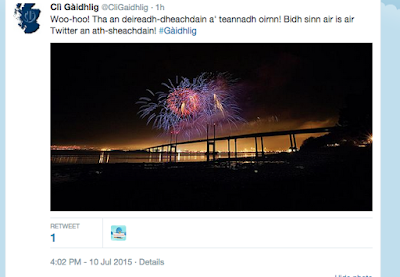 Tha Gilleasbuig an dòchas gun còrd an naidheachd iongantach seo a leanas ribh cho math agus a chòrd e ris-san! "Bu mhath leum" - manaidsear Acair. Ach saoil dè cho àrd?? 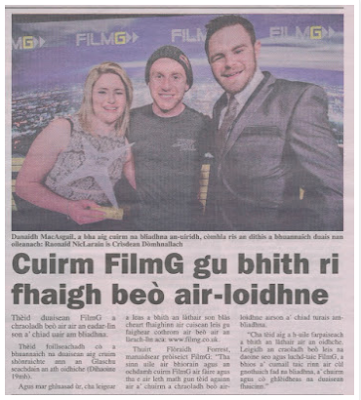 12mh an Gearran: fiosrachadh mun "chruim" aig FilmG! 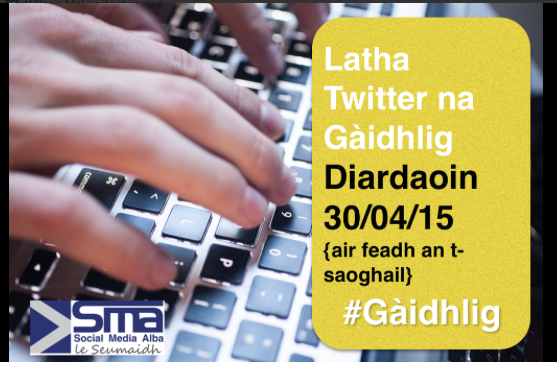 Hi a chàirdean chòire, 's fhad' on uair sin! 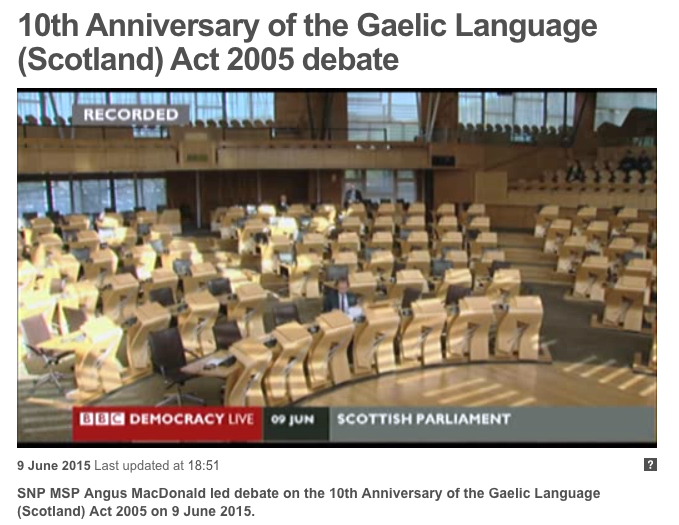 An t-seachdain-sa, tuigidh sibh, bha Gilleasbuig air a bheò-ghlacadh leis an agallamh seo a rinneadh cò' ri Alan Esslemont còir, ceannard prògraman BBC Alba, air Aithris na Maidne 2 Sultain (a' tòiseachadh aig 39.50). Chaidh a bheò-ghlacadh chun na h-ìre 's gun d' rinn e tràs-sgrìobhadh dheth, tràs-sgrìobhadh a tha e nis a' toirt seachad thugaibh, le'r cead. 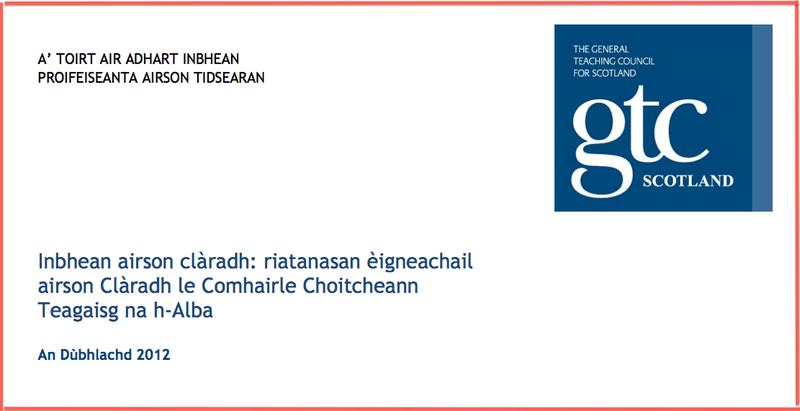 Tha e coltach gu bheil plan ùr aig RTE, sianal TV Èireannach, son beagan - beagan, cuimhnich! 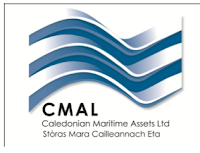 - dhen a' Ghaeilge thoirt a-steach dha na prògraman mainstream Beurla aca mar "brand asset" agus tha Esslemont air a dhòigh ghlan mu dheidhinn seo oir - you've guessed it - 's e rud cudromach a th'ann gun tèid rud beag Gàidhlig faisg air a' mhainstream, agus gu ìre tha BBC Alba an sàs ann an awareness-raising san aon dòigh, thuirt e (clò Eadailteach aig Gilleasbuig). MacIllethain 43.18 Nise tha … ’s e rud a tha 'ad ag ràdh san aithisg aca gu bheil ’ad ag amas air barrachd Ghaeilge a bhith an lùib seirbhisean RTE; dè chanadh tu fhèin, mar cheannard phrògraman BBC Alba mu na draghan a th’aig gu leòr mun ìre de Ghàidhlig ’s mu na tha de Ghàidhlig ri cluinntinn air BBC Alba? 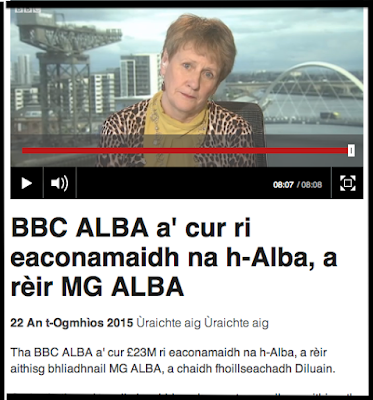 Esslemont 43.31 ’S e rud ma dheòghainn BBC Alba, tha sin soilleir, tha mi air a ràdh airson [tha mi?] 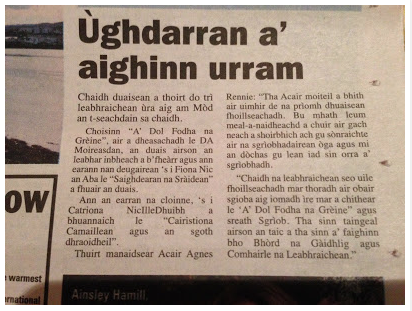 air fichead bliadhna a chur seachad, a’ coimhead air ciamar a tha daoine a’ dèiligeadh ri mion-chànain, ’s tha mi ’g ràdh, a thaobh prògraman telebhisein, tha ceithir luchd-coimhid ann, ’s e na faclan a th’ agam air seo, ’s e … an ceann. 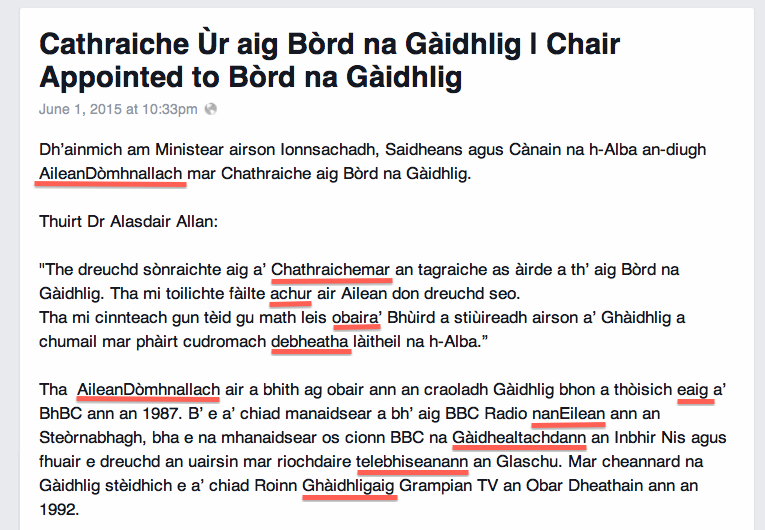 So tha daoine … far a bheil awareness. ’S e luchd-coimhid a tha cudromach a tha sin. Às a dheòigh sin, tha beul. 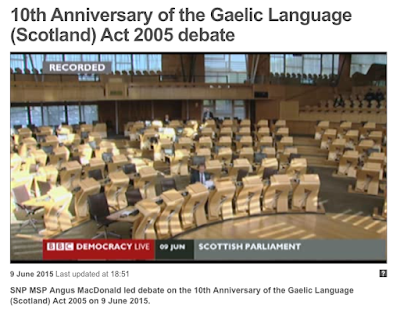 So daoine a tha bruidhinn beagan Gàidhlig. Agus tha ’n luchd-coimhid sin, tha iad cudromach cuideachd. Às a dheòigh sin tha cridhe, tha daoine coltach rium fhìn, a chuir tòrr strì ann a bhith ag ionnsachadh beagan Gàidhlig ’s tha – gu ìre fileanta agus às a dheòigh sin tha anam, tha core audience na Gàidhlig. So tha ceann, beul, cridhe agus anam sin ceithir luchd-coimhid eadar-dhealaichte agus mura h-eil BBC a’ frithealadh air ceithir luchd-coimhid a tha sin, tha sinn a’ dèanamh rud a tha cèarr, tha e cèarr dhan a’ Ghàidhlig agus cèarr dhan a’ luchd-coimhid gu lèir. 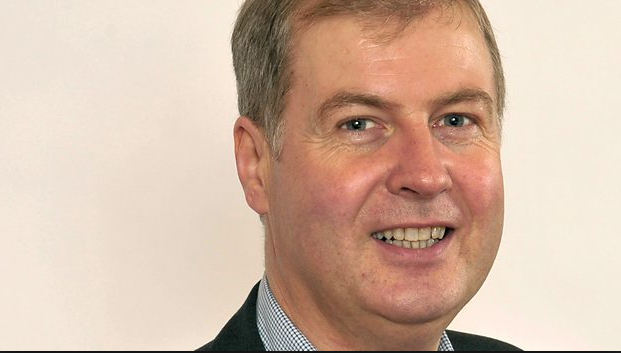 Mac’Illeathain, 44.35 Tha gu leòr ann, ged-tà, a tha faireachdainn gu bheil fada cus prògraman air an t-sianal far nach eil gu leòr Gàidhlig ri cluinntinn, gu bheil fada cus Beurla nochdadh air na programan sin agus gu bheil sin gan gluasad air falbh bho na Gàidheil. 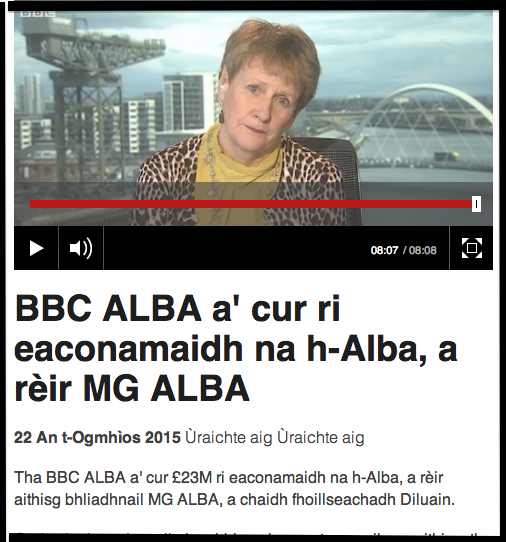 Esslemont Tha mi cluinntinn sin bho mu fhichead neach tha ga ràdh sin ach, em, tha sinn air a bhith dèanamh tòrr rannsachadh air luchd-coimhid BBC Alba agus a thaobh luchd-bruidhinn na Gàidhlig, cha robh ìre toileachais riamh cho àrd sa tha e an-dràsta, so tha e sealltainn gu bheil Gàidheil a tha bruidhinn a’ chànain, a’ mhòr-chuid aca, well a h-uile duine aca tha dà chànan aca, tha iad a’ tuigsinn rò-innleachd BBC Alba agus tha iad taiceil, tha daoine air an iomall a tha ag ràdh chan eil seo math gu leòr, ach air an iomall eile, luchd-bruidhinn na Beurla, tha daoine ag ràdh well carson a tha sinn a’ cosg airgead idir air a’ Ghàidhlig so feumaidh sin frithealadh air a’ chuid as mò de dhaoine is feumaidh sinn rò-innleachd a bhith againn a tha fallainn airson a’ chànain agus a bhith dèanamh ghetto a-mach à BBC Alba chan e rud a tha sin a tha fallainn airson na cànain. Neach-naidheachd air choireigin 45.40: Alan Esslemont, ceannard prògraman BBC Alba ann a sin. Cha chan mi càil mus can mi rudeigin leithid: transparent attempt to smuggle in, under a veneer of Gaelic, a fifth-rate "pan-Scottish" TV channel. Cha chan!